Nowadays, having a personalized and tailored advice about a possible location is what tourists are looking for. According to their needs and personality, they try to find the best place possible; and they want to find it as quick as possible! Provide this kind of recommendations is one of the main Mysmark’s goals with its ‘Combi-Action™’. Among all the research done during the recent months is the one made for Tourism Ireland where we tried to analyze in deep this new opportunity. After the fulfillment of the socio-demographic form (Age, Gender, Nationality) the user needs to click on Combi-Action™ at bottom implemented in the “Search button”. It has been developed to easily convert an online action into a combined action, a collaborative filter to boost a user’s personalized experience. With Combi-Action™ you can collect a small-data about your users while they search, book or buy from you, and leverage it into a smart data to better connect their profiles with your inventory, a recommendation, a personalized content or call-to-action. 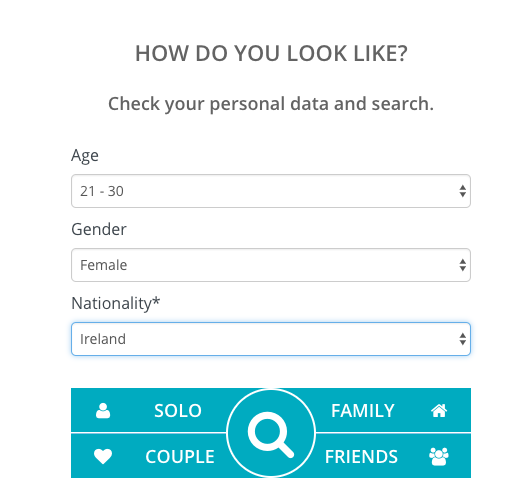 Our suggestions are based on our research called ‘Destination Personality Ireland’, in which we have explored the links between human and destination personality. With this dataset, we create a database useful to create the first recommendation. After the firstCombi-Action™ Button, the user can choose one among all the destinations advised. After that, with another Combi Action Botton concerning the labels “Hotels, Activities, Restaurants, Rentals” the user is addressed to the most personalized choice, this time using the TripAdvisor data set.